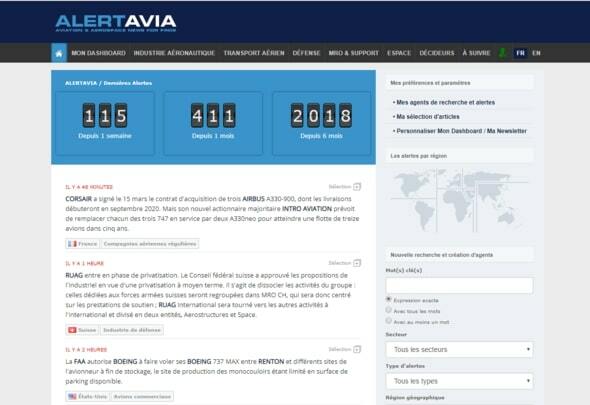 ALERTAVIA is a Multilingual News platform for Aerospace and Defense industry Professionals. ALERTAVIA is published by Le Journal de l'Aviation (www.journal-aviation.com), the leading aerospace news website in French. ALERTAVIA is a broad digest of essential news in the form of Alerts, a synthetic, accurate and very responsive easy-to-read format to maximise your precious time. ALERTAVIA also comes with many features to keep you informed as soon as possible (personalized newsletter, search agents, email alerts, advanced information prioritization, optimization for reading on mobile…). ALERTAVIA's editorial staff is attending many aerospace events around the world and provides dedicated coverage.